Anyone overhearing a Chinese person’s telephone call should quickly be familiar with the following dialogue: “uh, uh uh, uh, uh uh uh”, which is usually interspersed with the occasional “hǎo de”. hǎo 好 means good. And de 的 is simply a particle indicating possession, similar to the word “of” or the possessive “s” in English. 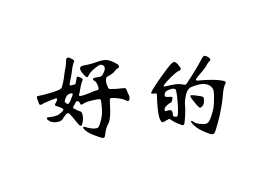 de is actually the most common Chinese character, estimated to account for 2% of all written Chinese. Impressive for a word that doesn’t even mean anything on its own. hǎo de can also be used like a more informal “thanks”, or “cheers” as we say in Britain. So when the street vendor has finished preparing your fine cuisine and hands it over in a plastic bag you can say ” hǎo de”. If you do say the word for thank you (xiè xie) it could be a bit too formal and indicate social distance, thus seeming less friendly than not saying anything. It’s perhaps better to just say hǎo de, because In China you can be guaranteed that hǎo de will be one of the most common words you encounter.